For those of you who aren’t familiar with it, Angular is, simply put, an open-source front-end framework, developed by the mighty Google in order to be used to create dynamic, modern web-based apps. It’s been around four 10 years now, during which it gained a lot of traction, as it managed to get rid of unnecessary code and ensure lighter and faster apps hit the market. 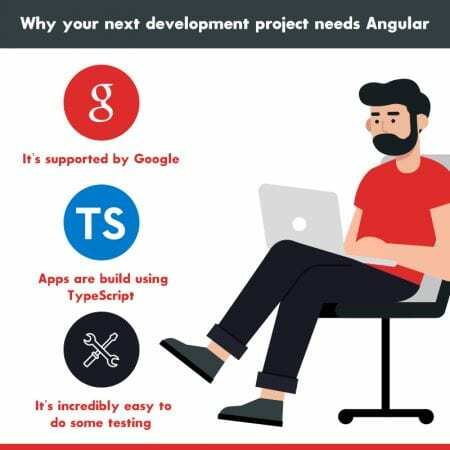 Still, there are quite a few devs which aren’t aware of the ‘power’ of Angular, so we decided to put down some of the most important reasons why it’s the best choice for your upcoming project. By far the biggest plus of this framework is the fact that it’s officially supported by search-engine giant Google, as part of the Long-Term Support offered by the search engine giant. This somehow confirms that they are planning to stick with it from now on and even scale up the entire Angular ecosystem in the near future. TypeScript code can be debugged directly in the browser of an editor of your choice, as long as you have the proper map files created during the build time process. By this, improved navigation is used, as well as services used for autocompletion and refactoring. Seriously now, Angular provides you with one of the easiest ways of checking things. The .js modules come with application parts, otherwise not difficult at all to manipulate, while thanks to module separation, you can basically load all the services you need, while performing some automatic testing. As a bonus, you don’t need to remember the entire order of module loading, as long as you follow the basic “one file-one module” principle. The framework from Angular is fully embedded with the Model-View-Controller software architectural setup. But there is one ‘problem’: it’s not according to the established standard, otherwise known by everybody. To be more specific, Angular doesn’t require devs to split an app they’re working at into MWC components, then build a code able to reunite them. Instead, it just asks to divide the app, then takes care of what remains. And this means that both Angular and Model-View-View-Model design structure share a lot of common features. One of our favourite things about Angular is the way it organizes code using buckets, no matter if we’re talking about components, pipes, directives, or services. But if you’re familiar with it, you’ll most likely use ‘modules’ when referring to these buckets. So, these modules can totally transform the organization of application functionality, splitting it into reusable chunks and many features. Therefore, it allows lazy loading, which – allow us to use this word – paves the way for loading app features, whether it’s in the background or, of course, on-demand. In a nutshell, Angular makes dividing the work across multiple team members achievable, while ensuring the code remains organized. And we all know that organization is key when it comes to pretty much any project, right? With a team of experienced software developer, IB Systems USA can help you with outsourcing your projects, whether we’re talking about Front End – Angular has no secrets for them – databases, frameworks and platforms, unit and testing integrations, third-party libraries, as well as cloud solutions.